..... Balance Trading .....: Is Volatlity Coming Back? SPX has been trading in a narrow (60 point) range for the last 8 weeks. This is very likely going to change starting this week as the US presidential election uncertainties begin creeping in. Markets hate uncertainties and a Trump presidency, which is highly unlikely in my opinion, would significantly elevate those uncertainties. Clinton, on the other hand, represents the status quo and continuation of Obama financial policies which have been super friendly to markets. (A - 40%) - Clinton starts pulling ahead of Trump by double digits. Under this scenario every dip in indices is a buying opportunity. (B - 35%) - Polls remain tight, giving a slight edge to either Trump or Clinton. Under this scenario also, every dip in indices is a buying opportunity. (C - 20%) - Clinton pulls ahead significantly. Trump quits. Again, all dips should be bought. (D - 5%) - Trump pulls ahead significantly signalling a possible win by Trump. Markets would suffer and probably crash if Trump gets elected. No change since last week. 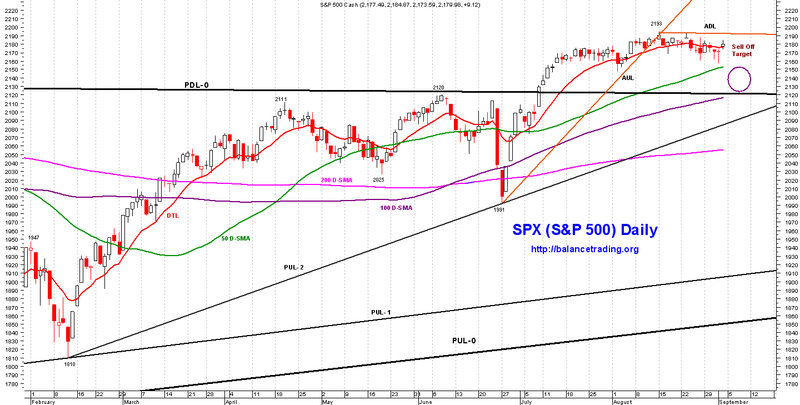 Again on Friday, SPX tested the lower channel line of its bear flag formation (shown in above weekly chart in pink). 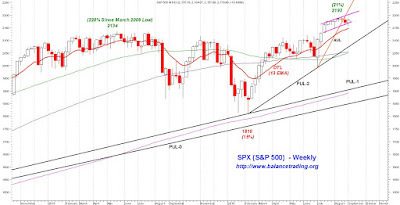 Chances are high that selling continues in the next couple of weeks and as SPX tests its DTL (13 EMA) around 2150. 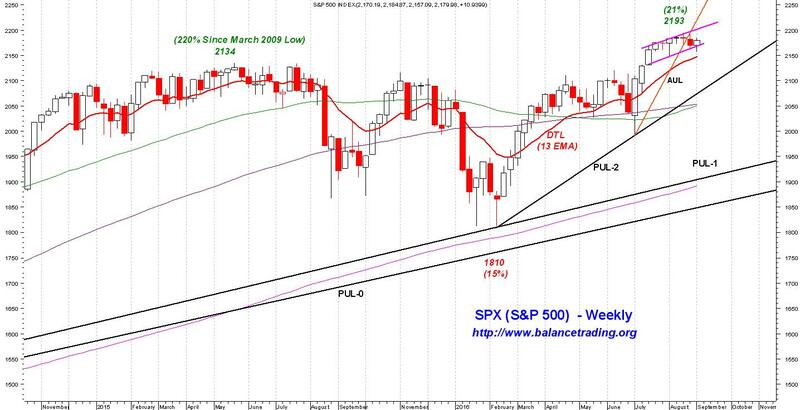 A close below DTL this week would signal more selling as SPX tests its PUL-2 around 2100. Again no change since last week, indices are still overbought. 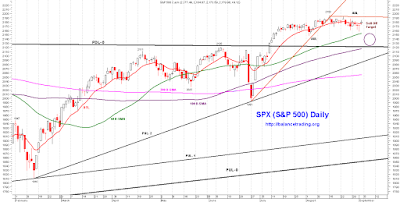 Chances are good that SPX sells off this coming week to test its 50 D-SMA around 2150. 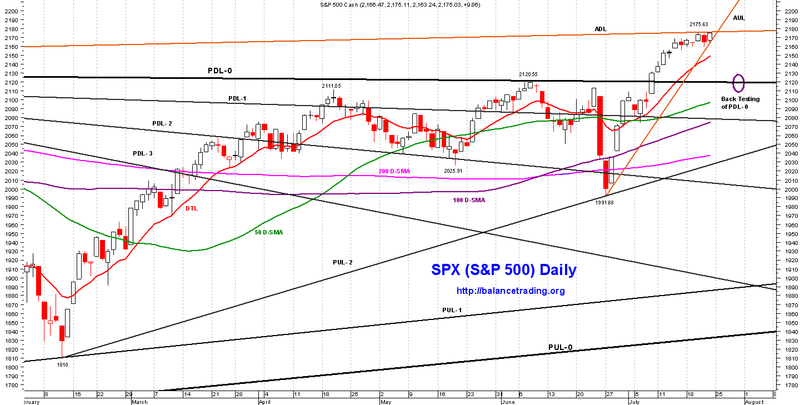 Should selling gets panicky, there is a good chance that SPX drops down to 2120 intraday. No change, my plan still is to open long positions in SPY. I'm planning to open my first of three long positions in SPY sometime this week as SPX sells to tests its 50 D-SAM around 2150.